The 2016 Inglis Great Southern Sale concluded today with the sale of stakes winning three-year-old filly Mihalic for $310,000 capping off a hugely successful four days of selling at the Oaklands sales complex. Over 310 weanlings, 190 broodmares and 150 racehorses have been sold since Sunday at an overall clearance rate of 85% and generating $13 million for vendors. "I think it is safe to say that this sale truly came of age in 2016. Every session recorded big increases in aggregate and to see the gross receipts jump from $8.5 million to $13.2 million in the last twelve months is so pleasing," said Simon Vivian, Inglis’ Victorian Bloodstock Manager. "The support we have received from our Vendors has been rewarded with outstanding competition from buyers, leading to a most successful and enjoyable sale," he added. Mihalic (Lot 905) was the last lot into the supplementary catalogue and she provided the highest price of the sale when selling for $310,000. 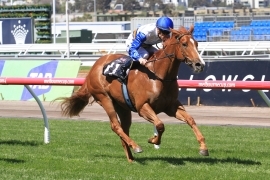 The daughter of Hard Spun won the Listed VRC Maribyrnong Trial Stakes as a two-year-old, was placed again at stakes level this season and offered today by Supreme Thoroughbreds. Hailing from a sister to the dam of Sertorius and Clifton Red, Mihalic’s family is one on the move as evidenced by her yearling half-brother by Reward For Effort selling for $380,000 earlier this year at the Inglis Premier Yearling Sale to the China Horse Club. Earlier in the day well related filly Elite Rock (Lot 839) sold for $220,000 A G Williams Bloodstock (FBAA)/ Gold Front WA. By Fastent Rock from Group 3 winning Giant’s Causeway mare Awesome Planet, the three-year-old filly is a full-sister to Awesome Rock, which was first past the post in the Group 1 Australian Cup this year before being relegated to second place in the steward's room. The racing stock from Contract Racing was highly sort after with 17 of their Lots realising $640,500. They included Crystal Lily’s close relation Crystal Wind (Lot 742) that sold for $135,000 and Triscay’s in form granddaughter Iamhere (Lot 735) for $110,000, both which were purchased by Belmont Bloodstock. Toowoomba trainer Tony Sears made the trip down from Queensland worthwhile snapping up city placed Northern Meteor mare Solar Burst (Lot 734) for $46,000 and stakes placed three-year-old gelding El Greco (Lot 750) for $72,000 in partnership with David Mee’s Pinhook Bloodstock. Inglis' Make-An-Offer Service is available for all Weanlings, Broodmares and Racehorses that passed-in at this week’s Great Southern Sale.